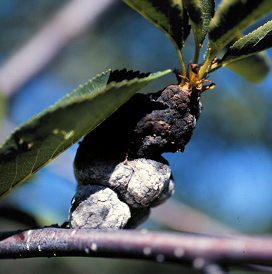 A typical older black knot gall with colonization by whitish secondary fungi. What is black knot? Black knot is a disfiguring and potentially lethal disease of trees and shrubs in the genus Prunus. This genus includes stone fruits such as wild, fruit-bearing and ornamental plums and cherries. What does black knot look like? During the first year of infection, black knot-infected trees develop greenish-brown to brown swellings on affected branches and trunks. During the second year, these swellings enlarge into the ugly, black, erupting tumors (galls) characteristic of the disease. Older gall tissue (greater than two years old) often dies and then is colonized by fungi that give the gall a whitish or pinkish color. Severe black knot infections may cause general tree decline or death if galls girdle large limbs, or tree trunks. Where does black knot come from? Black knot is caused by the fungus Apiosporina morbosa, which survives in black knot galls on infected Prunus trees. Spores of the fungus are released from these galls and infect new branches in late spring/early summer during periods of wet weather and mild temperatures (55-75°F). How do I save a tree with black knot? To manage existing black knot galls, simply remove the galls each winter from infected trees, then burn or bury them. Prune branches six to eight inches below each gall. On trunks, you can use a chisel to remove tissue from at least one inch beyond the infected area. Be sure to clean pruning tools between cuts by dipping them for at least 30 seconds in a 10% bleach solution or alcohol (spray disinfectants that contain at least 70% alcohol can also be used). This will prevent accidental movement of the black knot fungus from branch to branch, or from tree to tree as galls are removed. How do I avoid problems with black knot in the future? In established plantings, remove any undesirable volunteer or wild cherry or plum trees from within 500 feet of susceptible fruit-bearing or ornamental cherries or plums. When purchasing new cherries and plums, carefully inspect trees prior to purchase to be sure they are black knot-free. When available, buy black knot-resistant cherry or plum species or varieties such as Prunus ‘Accolade’, Prunus sargentii, and Prunus maackii. DO NOT attempt to control this disease with fungicide treatments, as these treatments are expensive and not likely to be effective. For more information on black knot: See UW-Extension bulletins A2130, A3639 and AIDEA3 (available at http://learningstore.uwex.edu) or contact your county Extension agent. Thanks to Patty McManus and Teryl Roper for reviewing this document and Patty McManus for use of her photo.